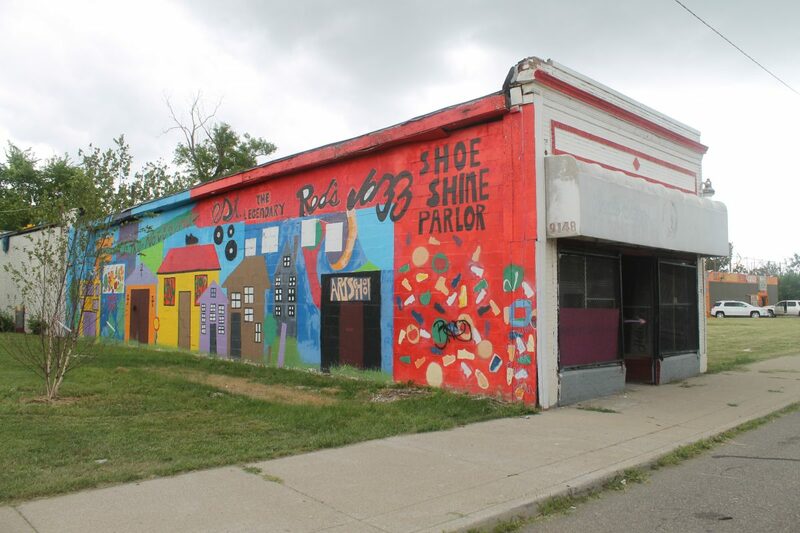 This summer, I consulted for Oakland Avenue Urban Farm which had just purchased the abandoned Red’s Jazz Shoeshine Parlor located at 9148 Oakland Avenue. The business itself still exists further south at 8348 Oakland. Our friend Jean-Louis Farges and his team, working on behalf of the farm, had discovered a stage in the back of the building. So they called on us. As director for Detroit Sound Conservancy, Red’s “Jazz” history as a musical meeting place for artists looking to shine up before a performance downtown or maybe even just down the street at Phelp’s Lounge was intriguing to me. But as a scholar of urban spaces in general and Detroit in general having the opportunity to see what these wall’s could tell us — if asked — was compelling. A few years ago, we had interviewed Larry Mongo who had grown up in the area. His Uncle had owned Red’s so we had already knew a little about the building and business. Here are a few things I learned during my brief historical survey. First off, the North End is not as old as you may think. Though Detroit itself dates itself to 1701, the North End itself as a Detroit neighborhood has only existed over the last 100 years. It was a very new neighborhood beginning in the early 20th century. I found that out very quickly when reviewing a Robertson Atlas from the Detroit Public Library. Of course, long before the neighborhood that we know now as the North End emerged, there were others who “occupied” this land, from earlier settler and colonial communities, to Native American peoples, and, perhaps most importantly, plant and animal species that made up this area since the last Ice Age. 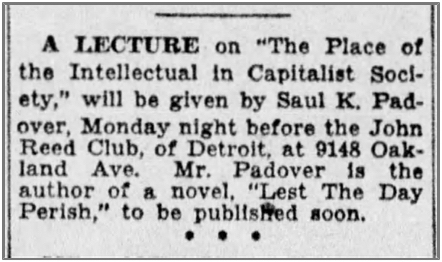 If you have not done so, I strongly recommend reading Fitzgerald: Geography of a Revolution for one such model of a geographical “deep dive” into a Detroit neighborhood. 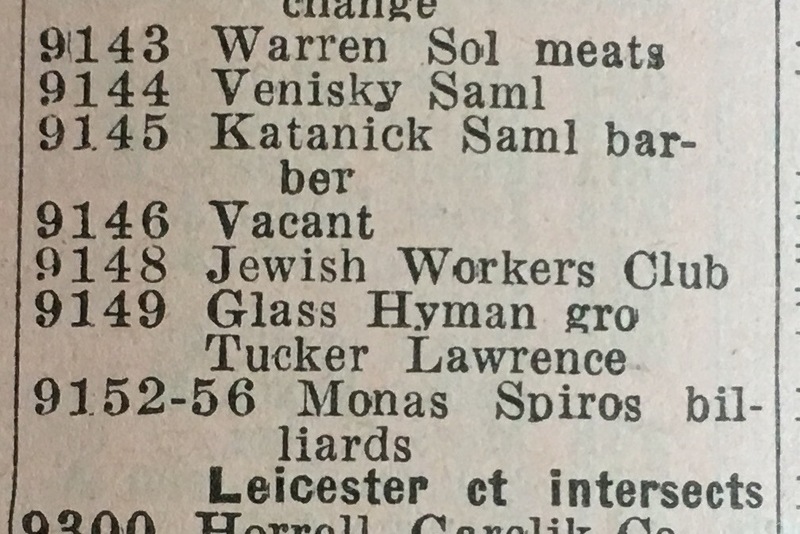 Second, I discovered that 9148 Oakland built in 1925 was not always a Shoe Shine but in fact spent some of its earliest years as a Jewish Worker’s Club and later the home of a John Reed Club. The two-track player from the 1970s was too water-logged and damaged to be fixed but still provides a taste of another era represented by Red’s. The Shoeshine now will become one part in a much larger but highly organic and locally-controlled redevelopment plan currently in conceptual plans with Akoaki of which Jean-Louis is a principal. The Oakland Avenue Urban Farm is restoring and reactivating the historic Red’s Shoe Shine Parlor. For over half a century, the space was a cultural and commercial epicenter in the North End. A small scale mixing chamber of the city’s to performers, politicians, and luminaries, the shoe shine provided a storefront cover for a speakeasy where the Temptations, Smokey Robinson, and Aretha Franklin made regular appearances. By Spring 2018, the Farm plans to reopen the space as a hybrid urban attractor combining services (shoe shine & cobbler), commercial space (boutique), and an event-space (performance & party) for family-size, intimate gatherings. The complimentary programming will maximize 24-hour use, and appeal to a wide ranger of audiences in the immediate neighborhood and the city at large.